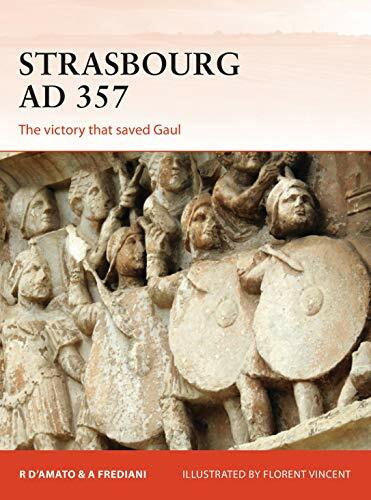 A highly illustrated account of the battle of Strasbourg in AD 357, a decisive victory for the Romans under their Caesar Julian against the Alemanni and their leader Chnodomar. Civil war in the Western Roman Empire between AD 350--53 had left the frontiers weakly defended, and the major German confederations along the Rhine--the Franks and Alemanni--took advantage of the situation to cross the river, destroy the Roman fortifications along it and occupy parts of Roman Gaul. In 355, the Emperor Constantius appointed his 23-year-old cousin Julian as his Caesar in the provinces of Gaul with command of all troops in the region. Having recaptured the city of Cologne, Julian planned to trap the Alemanni in a pincer movement, but when the larger half of his army was forced into retreat, he was left facing a much larger German force outside the walls of the city of Strasbourg. This new study relates the events of this epic battle as the experience and training of the Roman forces prevailed in the face of overwhelming German numbers.